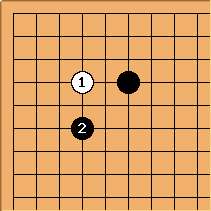 Unconventional corner opening play first developed as part of the shin fuseki experiments played by Sekiyama Riichi, Kitani Minoru, Hashimoto Utaro among others. Recently it has been used by Chen Linxin, Yamashita Keigo, Yoda Norimoto and Yuki Satoshi (in Gosei title match). It remains very uncommon. 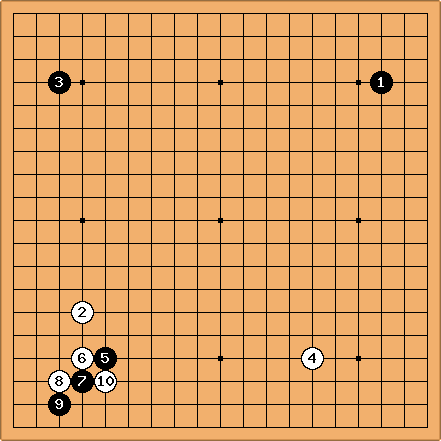 Currently Gan Siyang 4P plays 6-4 openings almost exclusively. 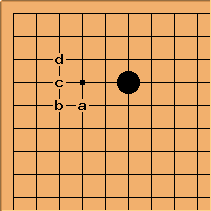 Commonly White then approaches at a, or Black makes a shimari at b, c, or d.
There are some recognisable 6-4 point josekis. They usually occur in practice as tenuki joseki.